Well this is not an exhaustive list by any stretch of the imagination, but it is a list of the bad habits I see the majority of my clients consistently practicing when it comes to choosing, creating and using performance measures or KPIs. We reap what we sow, and that’s why it can be a useful exercise to see if you do have any bad KPI habits and start developing some better ones. When you brainstorm KPIs, you end up with too many, not enough, things that aren’t really KPIs and a very shallow understanding of exactly how you will measure them. 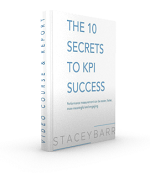 Instead, you need to design KPIs deliberately so that they are convincing evidence of the goal or result you want to measure. The reason to measure something isn’t that you have the data and can measure it easily. 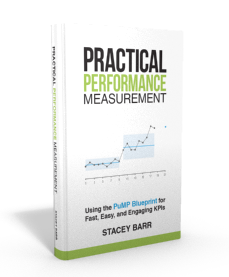 The reason to measure is that you need to know something very specific about how well, or to what degree, you are achieving a particular goal or performance result. Only measure what you should, can and will do something about. Embarking on the task of finding the right KPI to measure effectiveness will be a frustrating journey into Weasel World, that place where words lack meaning, or mean 17 different things to five different people. Don’t try measuring any goal or performance result that is written with weasel words until you talk about what those words specifically mean in the Real World. If you think a goal or performance result isn’t measurable, then there’s a good chance it also isn’t observable. If you can’t observe in some manner or form whether or not a goal has been reached, then you don’t have a goal. Goals are about changing the world in some way, and if you can’t define that change in observable and measurable ways, your goals need more work before you should bother about measures. How will you ever get the data you really need, the data about the goals and performance results that matter most, if you keep refusing to measure something because that data doesn’t already exist? When you separate the act of designing the right measures from the act of deciding how feasible those measures are to implement, you give yourself the chance to see that often the data is easier to get than you first thought, or at least worth the effort. Milestones are statements about having completed something by a particular time. They’re very appropriate in project management, but next to useless in performance management. Just getting something done isn’t evidence that it produced the desired result or that performance is improving. Just because you implemented a new inventory management system doesn’t guarantee that inventory management costs have reduced. More people complain about being measured than rejoice. And it’s either because the measurement is being done poorly or the real purpose of measurement is poorly understand. Until you have a culture where performance measures are used to improve performance without blame – and using measures to improve process performance is a great way to establish this culture – measuring people will always cause more problems than it solves. If you have too much of anything, it overwhelms you. Too many things to do and you’re exhausted and don’t do any of them particularly well. Too much to think or worry about and you’re stressed and emotionally burned out. Too many KPIs or performance measures, and your attention is fractured and no area of performance will improve significantly, if at all. Once more, only measure what you should, can and will do something about. While it is important that your KPIs don’t mislead you, most people still tend to err on the side of caution and not use any measures that are based on data that isn’t perfect, or measures that don’t tell the full story. As long as the measures aren’t severely biased, their reliability can be far less than perfect and still provide you with actionable information, particlarly information about trends or shifts in performance. TAKE ACTION: Do you know how to change a bad habit? You find a habit to replace it with, and you practice that new habit everyday for at least 30 days. By then, the new habit will replace the old one. You might like to choose one of your bad KPI habits and decide on something simple and practical you can do everyday to break it and establish a far better one. Very interesting article. In sales often KPIs are based on the number of calls / conversations / meetings / hours on the phone / hours in front of the client. My problem is, these do not take into account the quality of the client facing time. Now you could ask reps to rate quality, but that is very subjective and, can easily be manipulated by dishonest people. In certain cases, 10 quality mins with a client can be better than 2hours cold-calling. How do you measure the progress of a relationship, I wonder? The first step of measuring the progress of a relationship is to describe what kind of progress you want. Do you want to know more and more about each other? I doubt that’s an end in itself, in business relationships. For sales, I imagine the progress you want is for a lead to become a prospect, and for a prospect to become a customer, and for a customer to become a repeat customer, and for a repeat customer to become a loyal customer. Then you’d measure the flow of customers through that ‘progress’ pipeline.